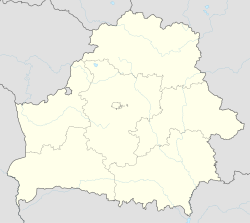 Stowbtsy (Belarusian: Стоўбцы, Stoŭbcy, Belarusian pronunciation: [ˈstowpt͡sɨ]) or Stolbtsy (Russian: Столбцы, IPA: [stɐlˈptsɨ]; Polish: Stołpce; Yiddish: סטויבץ‎ Steibtz, Lithuanian: Stolpcai) is a town in Minsk Region, Belarus, the administrative center of the Stowbtsy Raion (Stolbtsy district). It is located at the Neman River. The population is approximately 15,400. The city was founded in 1593. For a long time it was a shtetl with significant Jewish population. In August 1924, while Stowbtsy was part of the Second Polish Republic, the town was the site of a Soviet-Polish border incident in which a company of Soviet raiders attacked its police station and government building in order to free two imprisoned communist activists (see Soviet raid on Stołpce). In June 1941, there were more than 3,000 Jews living in the town, including several hundred refugees from the German occupied parts of Poland. The city was under German occupation from 1941 to 1944. After a week of occupation, the Germans shot around 200 Jews together with several dozen non- Jews, allegedly as a reprisal for sniper fire directed at German soldiers. On September 23, 1942, some 450 Jews were sent to their workplaces, and 750 Jews, most of them women, were shot in a forest, while another 850 either managed to flee or remained in hiding in the ghetto. On October 2, another 488 Jews, composed mostly of women and children were shot. Another 350 Jews were killed on October 11. On January 31, 1943, the remaining 254 Jews, including those brought in from Novy Sverzhen, were shot. In the following days, the captured Jews were also shot and 293 Jews had been shot by February 4, 1943. Some of the Jews who fled the ghetto survived by joining the Bielski partisan unit in the nearby Naliboki Forest. ^ "YAHAD - IN UNUM". yahadmap.org. Верхняе Панямонне: альманах лакальнай гісторыі. Вып. 1. Мінск: І.П. Логвінаў. 2012. ISBN 978-985-6991-72-4. .